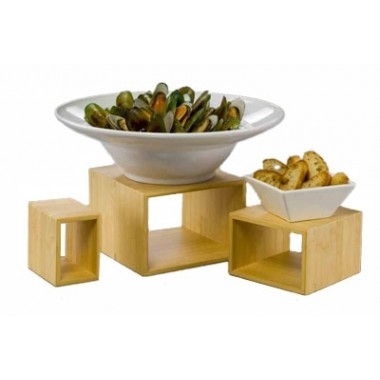 Display sets provide a unique and eye catching way to display apps, sushi, desserts, cheeses, meats, or any other type of delicious treat! Guests are sure to enjoy the stylistic feature and the attention to detail. Display sets are perfect for catering or buffet events like weddings, company parties, happy hours and more! Choose from our selection of risers featuring classic wooden sets, efficient plastic sets, or the modern metal designs to find the right fit for your establishment!